One of the highlights of early 2013 was Craft Beer Rising. It feels like a very different sort of beer festival - the brewers are there selling their own beers, rather than having one big bar, so it's a bit like a trade fair where you can wander around talking to people. Add to that some great food, and you've got a fun night. It's back for 2014 with more breweries - see list below - and food from Burger Bear, Feishmob, Hartland Pies, Little Jack Horner and more. It's 3 days instead of two in 2014 too, broken up into 4 sessions. Put it in your diary! "Every foodie adventurer and beer fan in town will jump at the line-up at the unbeatable Craft Beer Rising festival. It brings heady highlights of beer culture with some 60 breweries and over 200 beers, quality street food, and DJ sets by legendary Mr Scruff, Reverend & The Makers - just ahead of their UK live tour & new album and celebrating their new collaboration ale with Thornbridge Brewery – plus Horse Meat Disco, Pete Paphides (BBC6 Music) and more. 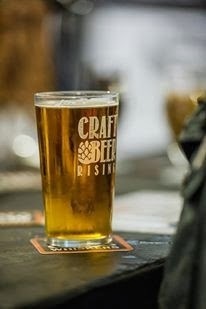 Immerse yourself in the craft beer revolution: Craft Beer Rising is named by the Financial Times as one of just five events which are ‘the UK’s hottest tickets of 2014’ – and that’s alongside landmark cultural events at the Tate and Glyndebourne. Craft Beer Rising on 21-23 February 2014 in East London’s Brick Lane is again all set to welcome a new generation of curious craft beer fans and a refreshing, balanced male and female mix. This so positively reflects the profile of the surging 7.8 million craft beer drinkers in the UK. The original big brother of all urban beer & music festivals serves up so many taste discoveries to entertain you in one place at the atmospheric Old Truman Brewery in East London. These are tickets to be snapped up fast; last year’s festival was a sell-out. Six spacious rooms will buzz with breweries, beers, food and music, all with a convivial party ambience. New this year - amongst the established and experimental names in British brewing, are discovery beers from USA, New Zealand, Belgium, France, Italy and Spain. Fascinating beer talks, taste matching and experimentation will keep you thinking whilst drinking. Melissa Cole tantalizes with Three Courses in Beer. Feed on hearty cook-ups, British charcuterie, meat and burgers with a twist – be treated by a new flavour creation for Craft Beer Rising - and inventive veg eats. Rendezvous at the Craft Beer Rising bar and try the new limited edition festival beer,- an American white ale with a hint of chamomile and lavender This year’s collaboration is with Brewhouse & Kitchen’s The White Swan brewpub in Portsmouth. Before the festival, grab a free Craft Beer Rising magazine in pubs and bars around London for insider tips on the most happening places to drink throughout the year and choice beers for 2014. Adnams, American Craft Beer Co, Atlas Brands Ltd presents Birrificio Italiano, Birra Del Borgo, Brewfist and Toccalmatto (IT), Arbor, Batemans, Bath Ales / Beerd, Beavertown, Beercat, (ES), Bellerose (FR), Blue Moon (US), Brains Craft Brewery, Brewdog, Brighton Bier, Bristol Beer Factory, Butcombe, By The Horns, Camden Town Brewery, Cave Direct Beer Merchants, Celt Experience, Crafty Dan Brewery, Curious Drinks, Duvel (BE), Firebrand Brewing, Fordham and Dominion (US), Founders (US), Franciscan Well, Freedom, Fullers, Greene King, Harbour, Harviestoun, Hawkes Ginger Beer, Harry Bromptons, Hiver, Hogs Back, Ilkley, Islay Ales, King Beer Lagunitas (US), Late Knights, Left Coast Distribution, Liberation, London Velvet, Meantime, Meduz Brewery (FR), Nene Valley Brewery, Old Dairy Brewery, Oro di Milano (IT), Otter Brewery, PALM Breweries (BE), Redwell, Renaissance Brewing (NZ), Revisionist, Sharps, St Austell, Stewart Brewing, Tap East Thistly Cross Cider, Thornbridge, Truman’s, WEST Brewery, Wells and Youngs, Wiper and True. The awesome, multiple award-winning Yeastie Boys, of New Zealand will swing by for an exclusive tasting session during the Saturday afternoon. Food - Burger Bear burgers with a one-off version of his bacon jam produced for Craft Beer Rising 2014; Fleischmob, Hartland Pies, Little Jack Horner’s, Moons Green charcuterie and Dosa Deli will keep you grazing contently late into the night."